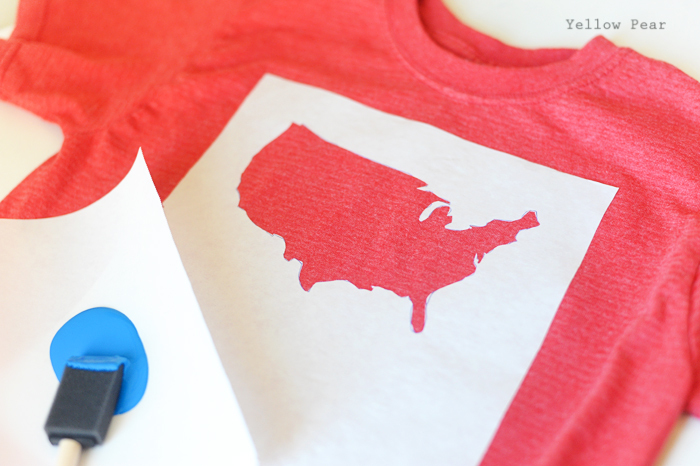 Last year the kids and I made some awesome freezer paper shirts for the 4th of July, so I thought we would make a couple of new ones this year. 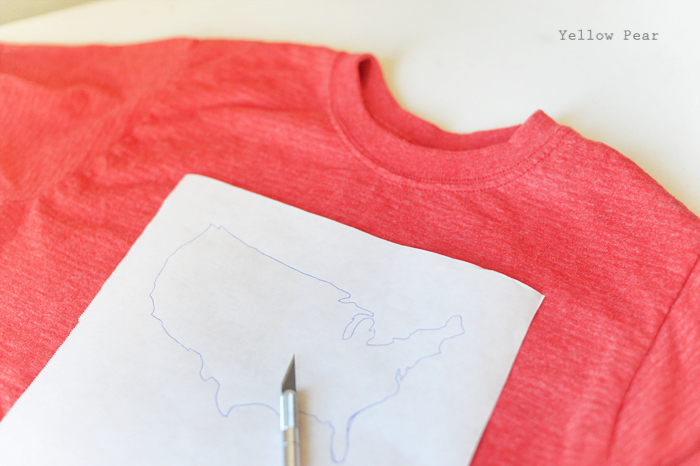 If you haven't made freezer paper shirts yet, then I thought I'd give you a quick tutorial, because it is so fun and versatile. You should definitely give it a try. 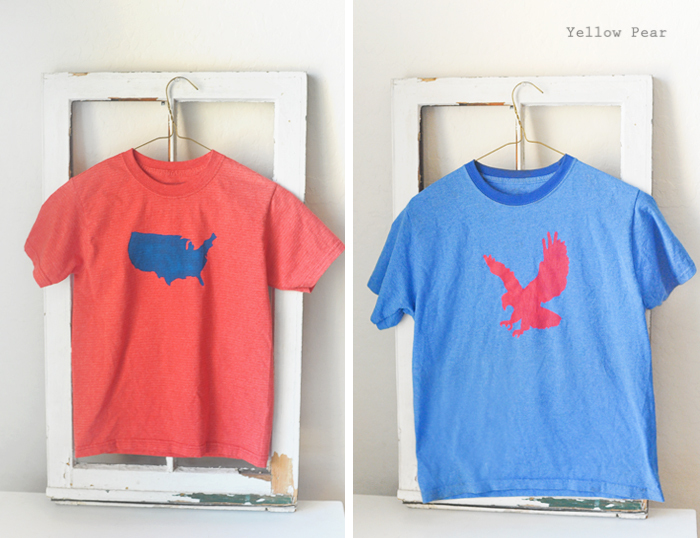 I made the U.S. map one yesterday for Dennis and the eagle shirt was made last year for Mr. C. I like to keep them simple so they can wear them all year. First you print out an image that you like and trace it onto freezer paper (shiny side down). Next you carefully cut out the middle of the image with an X-Acto knife (the sharper the better). Make sure to do this part on a cutting board. Then iron your new customized stencil onto your shirt with a very hot iron. Make sure your image is centered and straight and that you iron each of the tiny pieces down very carefully so they will not lift up during painting. 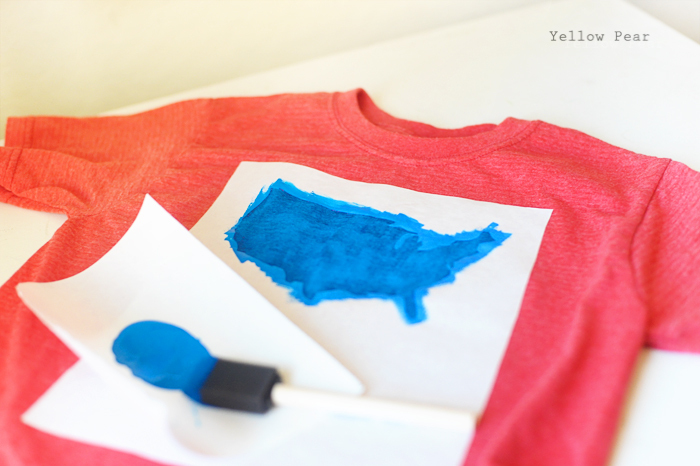 Finally, put a piece of paper between the layers of your shirt to prevent bleeding (this is a very important step) and then carefully paint inside your stencil using regular acrylic craft paint...you do not even need the special fabric kind. Do not use very much paint or it will leak under the stencil. I tend to dab the paint on being extra careful to brush away from the edges. I like to do 1-2 light coats because I like the rustic, slightly washed out look. Then let it dry a bit and carefully peel off your stencil (usually peeling on a diagonal works best). 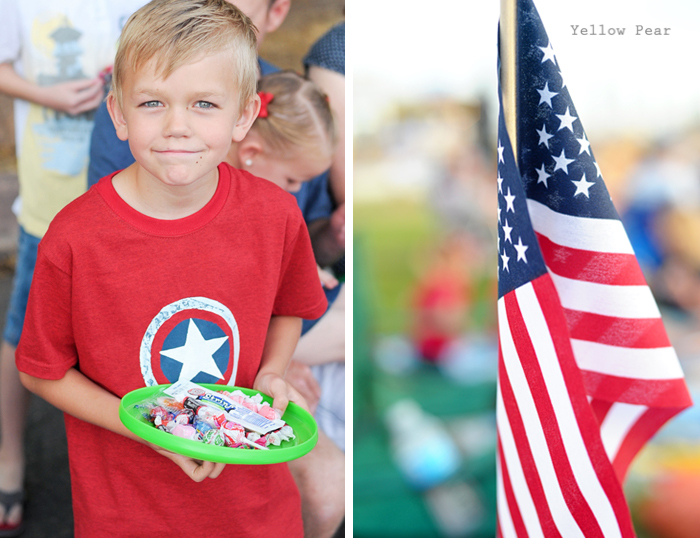 Last year for Dennis, we made a Captain America shield. It was a bit more tricky because we had to layer the stenciling in steps and then Miss B accidentally painted the outer rim blue. So we had to paint over it with white. Then when we went to iron the star stencil on, the iron took some of the paint off of the white rim, revealing some of the blue beneath...but it looked so perfect and banged up just like the real shield! I love it when that happens.